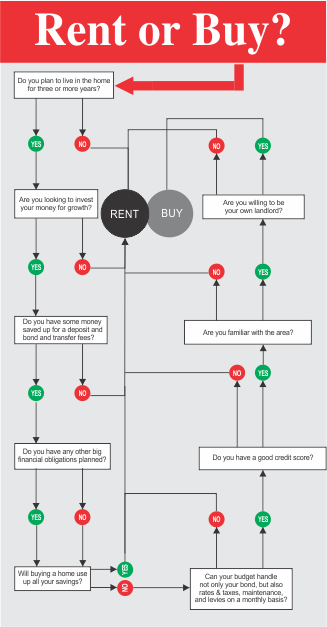 Many of us are often faced with the choice of buying or renting. And even if you already own a home, the choice to upscale might end up with you rather considering to rent a larger home than to sell and purchase another. “There are pros and cons to both,” says Craig Hutchison, CEO of Engel & Völkers Southern Africa. “The eternal truth remains, though, that property continues to be the most solid investment in today’s economy, and if you are prepared to hold onto a well located property for a couple of years, you are virtually guaranteed a significant return on your investment. There are a number of factors that you need to consider when buying a property, especially when it comes to costs. “In a rented property, you don’t have to worry about maintenance and even some utility bills that are included in your rent, whereas you need to set aside money each month for improvements or maintenance to a property you own. However, owning your own property means that you are putting money into your own investment each month, rather than paying someone else’s off – in itself one of the best retirement strategies around – even for those in their 20s and 30s,” Hutchison says. You will need a much smaller deposit when deciding to rent a home, and you will have more freedom to move around the country, or indeed the world, but it’s also worth remembering that when your contract with your landlord ends, you have nothing to show for all the money that you’ve paid across. The Landlord, on the other hand, does! Buying your own property also brings with it a feeling of pride and accomplishment – at last, tangible evidence of the money that you work so hard to earn! Apart from the simple emotional satisfaction, you are able to express your own personality in your own property – rented homes often come with restrictions on any home improvements, and you are also likely to be reluctant to spend your own money on improving someone else’s property. “Every individual has different property requirements, whether it’s for renting or purchasing a property. The best route to follow is to consult an expert who will be able to advise you on all your options, and their cost implications. Midrand Village team specialises in both sale & rental properties and will give you all the advice required to make your big decision” Craig concluded. http://midrandvillage.co.za/wp-content/uploads/2018/07/Buy-or-Rent-Main.jpg 379 1022 admin http://midrandvillage.co.za/wp-content/uploads/2018/06/Midrand-Village-Logo_padding-1.png admin2018-07-12 19:26:472018-09-07 12:38:39Should you buy or should you rent?